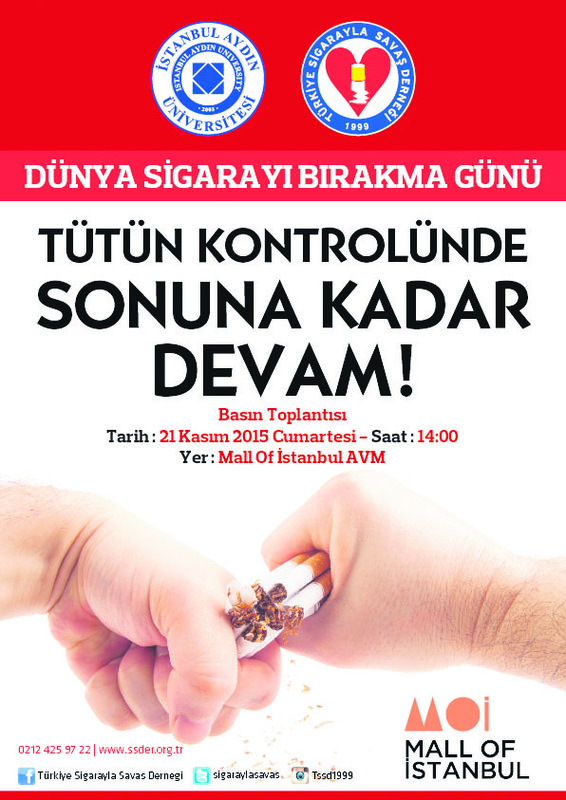 The Turkish Association for Fighting Smoking will hold a press conference titled "Continuing Tobacco Control" on Saturday at 2 p.m. at the Mall of Istanbul. The association's president, Mustafa Aydın, Başakşehir district head Kazım Tekin, Başakşehir Municipality Mayor Mevlüt Uysal and former governor of Istanbul province, Hüseyin Avni Mutlu, will speak at the event. The organization will highlight the importance of fighting tobacco use and discuss the harms of smoking on passive smokers. Aydın, along with Istanbul Aydın University's board chairman who initiated the "Smoke-free Campus" initiative, will offer insight about the project. Smoking, which is a global problem, alcohol consumption and related diseases, result in much larger health problems in the future. Smoking affects all bodily organs and causes problems in the spine, which connects the body like a bridge. The negative effects of smoking on our bodies are known facts. Smoking causes bronchitis, asthma, gastric ulcers and cardiovascular diseases as well as lip, testicular and throat cancers. Even if smokers exercise regularly, they tend to get waist and neck-related diseases 45 times more than people who do not smoke, as smoking causes fluids between the bones to dry out quicker than usual. Moreover, alcohol consumption causes similar problems. Speaking at the World Chronic Obstructive Pulmonary Disease (COPD) Day, Professor Çağlar Çuhadaroğlu said about 210 million people around the world suffer from COPD, and one in every five people above the age of 40 in Turkey suffers from COPD. However, it is easy to reduce the symptoms of this disease. Patients can make their lives easier by quitting smoking, exercising regularly, eating healthy, engage in breathing exercises and consulting their doctors regularly. Eight in every 10 COPD patients in Turkey suffer from shortness of breath, which deeply affects the daily lives of patients as well as the people around them. Patients have difficulty climbing stairs, engaging in heavy lifting and doing chores. As the disease progresses, it even becomes harder to walk around the house, do easy chores and relax on a sofa.